When it comes to Twitter following, the more the merrier is the keyword. However, this is not always the case especially when the ‘more’ part comprises of fake and spammy profiles. According to a new research by Barracuda Labs, Twitter has one of the highest amounts of social media shenanigans. In most cases, this menace is brought on by people selling fake accounts to the highest bidder. These phony accounts are also referred to as follower-bots and are designed to act as if they are a real human being. Some of them are actually capable of sprouting off tweets, re-tweeting content and following other users. The big issue is that the people creating them are getting smarter by the day. They even go to an extent of stealing information from real accounts and create a replica of the same. What I’m trying to say is that these days, spotting a fake follower can be nearly impossible. A sneak peek to the online market (eBay, Google and Fiverr) proves that the number of merchants pawning off Twitter followers for different price ranges is on the rise. That being said, it is essential to keep re-evaluate your Twitter following just to ensure that your soaring stats of your following are not made up of fakes. Why is it important to scan your Twitter following? If you have a social media account, be it Twitter, Google+ or Facebook for marketing your business, chances are you do look at the stats of your following to gauge how much resources you’ll need to use to achieve the best [p2p type=”slug” value=”7-best-tools-to-change-your-social-media-marketing”]marketing[/p2p] results. But what if today you realized that 35% of your followers are fakes? To give you the real picture of the situation on the ground: Just a couple of months ago, superstar Justin Bieber was announced to have reached 40 million Twitter followers. However, a few week later, more accurate findings surfaced and it was established that over 44% of Justin’s followers were fake. In fact only 35% of his massive following was made up of real humans! Apparently, Justin is not the only victim of phony followers as Kim Kardashian had also, reportedly, suffered the same predicament earlier. The issue of fake Twitter following is real and can affect literary anyone. Let’s face it, spams and fakes are a part of the online society and you will not succeed in barring them completely from finding their way to your follower-base. But at least you can quarantine a sizable number of them to at least end up with digits that are close to reality. How To Find How Many Fake Accounts Are Following You On Twitter? 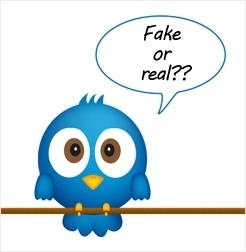 There are many software and apps out there that claim to help deal with fake Twitter accounts. However, to get the best results, it is imperative to use a service that it time-tested and proven to be efficient. We introduce to you Fake Followers Check, a free service by Status People that scans your [p2p type=”slug” value=”twitter-background-matter”]Twitter following[/p2p] to separate the wheat from the chaff in terms of identifying the actual number of real accounts that you have. The service is quite easy to use; you simply connect to your Twitter account and let it run its process. This normally takes a couple of minutes. Fake followers app takes a small sample of followers and evaluates them against several checks. It sniffs out accounts that have very few or no followers or very low activity, to compile a percentage. Apparently, the app is more accurate if your account has less than ten thousand followers. The best thing about this app is that it is highly efficient in analyzing sample data. Another plus with using this app is that it is highly accurate and quite easy to use. Although it is not clear which algorithm it uses, its results are more often than not something worth smiling about: it shows you the spammer’s name, number of tweets, friends, followers, day active and most importantly Kred score. Once the fakers are identified, it is up to you what to do. You can either choose to block them from your account or clear them by removing the fake label. It’s high time to stop relying on numbers altogether and shift to real time data for a better Twitter marketing experience. All the best! Heya.. really informative post and its really help me a lot to find out the fake twitter profiles. It’s truly a great and helpful piece of information. I am satisfied that you simply shared this useful information with us. Please stay us informed like this. Thank you for sharing. Many thanks an additional info. Thanks for your informative post. I really didn’t know this before.